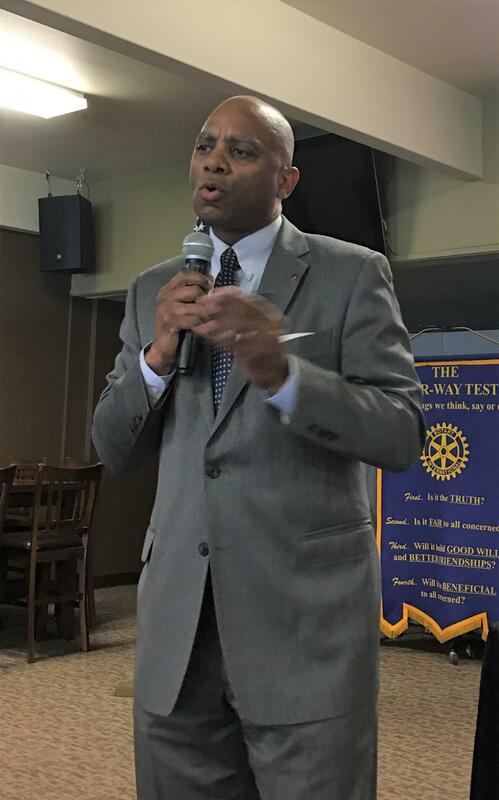 Dr. Paul Pitre, the Chancellor for Washington State University's Everett was our program on April 11. In addition to being the Chancellor, he is an associate professor of Educational Leadership and Counseling Psychology at WSU. Paul grew up in Washington and has focused his career on access to higher education. In the State of Washington, we are ranked 46th in the nation for those who go to 4 year higher education. W.S.U. wants to ensure that all students have access to high education. It's focus is on STEM and preparing students for careers. State Board of Education says there is supposed to be 7500 new jobs in 5 years and 70% of those will require post secondary education. Will those be filled by students from the state of Washington. Snohomish County population is forecasted to grow by 200,000 in 2040. 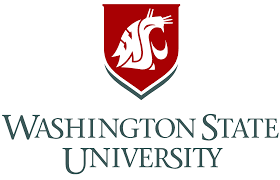 WSU Everett’s average age student is 25.5. W.S.U. is an upper division model only (junior and senior years only). They work closely with the junior college to recruit students. There is about 3.6% unemployment for Snohomish County. King County’s is 3.4%. 20% of jobs in Snohomish County are manufacturing jobs. W.S.U. Everett’s programs are focused primarily on engineering. W.S.U. Everett wants to improve and grow their business and manufacturing focus. Many students who graduate find jobs in manufacturing in the area. W.S.U. Everett wants to expand opportunities for access to education. They want to expand to graduate programs and provide practical experiences in the community. 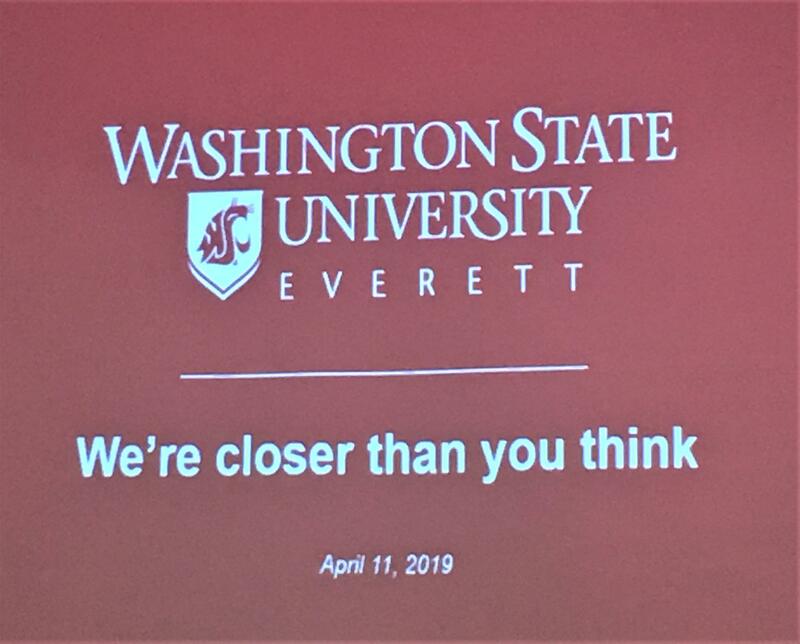 WSU Everett partners with other universities and located on Everett Community College campus. They hope to create additional public and private partnerships. W.S.U. Everett hopes to help improve W.S.U. as a whole. There are six campuses. Everett is the newest and smallest but they hope to contribute to the institution, locally, and globally. W.S.U. Everett wants to be the best at delivering undergraduate education and expand to graduate education later. They want to be a leader in research. W.S.U. 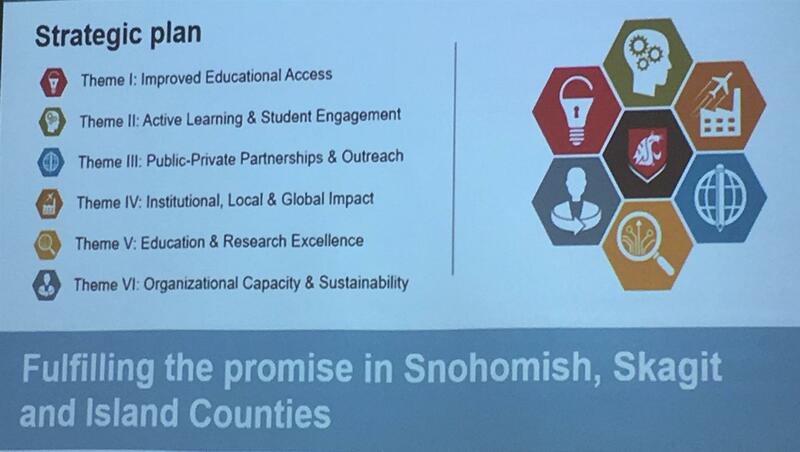 Everett is improving educational access by adding dual enrollment with Everett Community College, adding additional program offerings, and increasing scholarship support. The campus offers active learning and cross disciplinary offerings. W.S.U. Everett is working to potentially purchase more land to expand the campus and sustain the future growth.